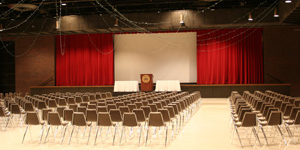 The Brown Ballroom is one of the largest rooms in the Bone Student Center. With a large stage, theatrical lighting, large screen, and tile floor surface, it’s perfect for large seminars, banquets, wedding receptions, bridal shows, concerts, and other large events. For convenience, a double door entrance is also available to haul large equipment or even small vehicles.